Over the last year, the Infotrends research and consulting teams have worked with transactional printers that print bills and statements and have learned that there are two very different opinions about the future of bills and statements. One group believes that printed bills and statements will remain critically important to consumers and they are investing in new hardware, while the other group believes that there is a rapid evolution to paperless, and they are investing in more software and services. 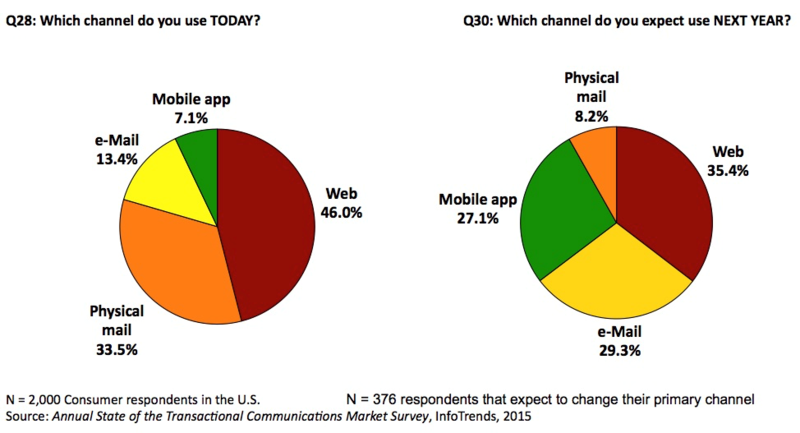 The same dichotomy existed for consumers, some are early adopters of paperless while others prefer print and mail. The only thing that anyone can say for sure is that the early predictions of the rapid adoption of paperless has proven to be exaggerated. We believe that companies producing bills and statements, as well as customers receiving bills and statements, expected the transition to paperless to occur much faster than it is today. The figure below compares predictions of the adoption of paperless bills and statements by the companies that make them. The yellow bars are the estimates while the red bars are the actual number of customers that have switched to paperless. In each case, the yellow bars are higher than the red bars meaning that these companies are consistently predicting higher and faster adoption rates of paperless. The 24% adoption shown in 2015 is not intended to show a slowing in paperless adoption (the deviation is within the standard margin of error), rather it shows that businesses continue to struggle to move the needle. In the InfoTrends Study Annual State of the Transactional Communications Market Survey 2015, 2000 people were asked how they paid their bills. The top answers were “over the web” and “physical mail.” In the same study, 376 people described themselves as ready to change their main method of payment. This 19% predicted that in one year they would use much less mail, somewhat less web payments, and significantly more mobile payment applications. But the simple fact of the matter is that people feel comfortable receiving bills and statements by mail. In the 2014 InfoTrends study, U.S. Customer Communications Delivery Market Forecast: 2013-2018, InfoTrends forecasted a gradual compound annual growth of paperless adoption at a rate of 3-5% a year. 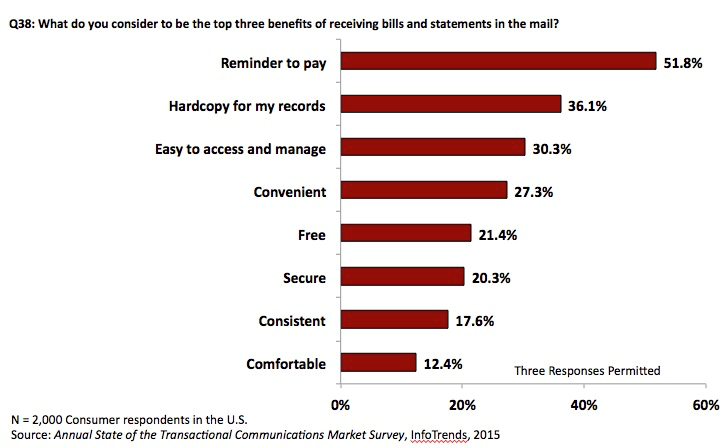 The top benefits people say about receiving bills and statements include: reminder to pay, hardcopy for my records, easy to access and manage, and convenience. Some claim that the slow adoption rate has to do with the “gray haired” demographic. However, it is somewhat oversimplified to say that this is simply an age demographic issue. In an article entitled, “Does Your Demographic Decide How You Pay Bills,” author Suzanne Cramer talks about a report from the New York City based market intelligence research firm Packaged Facts which showed that other factors including income and education also play a significant role in how one pays bills. It is likely that the shift to paperless bills and statements will occur much like other disruptive technologies. It will take longer than expected but have a greater impact than anyone could have predicted. For anyone interested in the latest information on the pace and acceptance of paperless is available to subscriber to InfoTrends’ Transactional Communications & Payments advisory service to have access to the all the ongoing research.